The Anveo Mobile App provides a lot of powerful features for your mobile application. You can easily customize all features to your individual business requirements in your well-known environment: the Windows Client of Microsoft Dynamics 365 Business Central and Microsoft Dynamics NAV. Image: Technical structure of the Anveo Mobile App. Synchronize data smart and secure. In the Windows Client, RTC or Classic Client you can customize the appearance and behavior of our sample apps to your requirements with just a few mouse clicks. In Anveo Pages, you can select desired fields and define buttons and menus according to your needs. The main menu is flexible in design. Colors and formatting can be fixed or dynamic based on data. For example: The display of overdue tasks could be bold and in red while archive information could be gray. Microsoft Dynamics 365 BC and Dynamics NAV offers a high grade of customization options. Our concept is this: Even your own complete, new data structures such as tables and fields (eg. in the 50,000 range) can be used in the app. Simply select tables and fields – done. With Anveo Script, a C/AL-like script language for the app, you can realize all business processes. Wizards, individual price calculations or other programming completes Anveo as a powerful tool. Watch in this video how you can add fields to your Anveo Mobile App solution. Simply select existing fields in Microsoft Dynamics 365 BC and Dynamics NAV Windows Client and publish this information on your smart phones and tablet PCs. This way, Anveo Mobile App empowers you to build any individual app user interface with some mouse-clicks only. Do you love your laptop, smartphone and tablet PC? So do we! However, while one likes iOS, the other likes Android or Windows. We offer for all systems its own app, which has its well-known appearance of the respective system – so you work most efficiently in a familiar environment. The setup for all systems is identical with no extra effort. Of course, Anveo runs on the current version of Microsoft Dynamics 365 Business Central 2018. However, Anveo also supports previous versions such as Dynamics NAV 2009 R2 to NAV 2017. With an easy technical update of the executables, you can even use Anveo with Navision versions from 3.6. With Anveo’s signature feature, your customer can confirm any documents like quotes, orders, and service orders by signing on the tablet or smartphone directly or with a special pen. The signature is saved as an image and is available in Microsoft Dynamics. With the Anveo Mobile App you can create any reportdocument offline and print it directly on premise. The integrated PDF library allows a flexible layout of the company logo as well as any custom data on the device. All devices which can create PDF documents are supported. Scan item numbers or other barcodes as well as QR codes easily with the integrated camera of your device. You can use a barcode to search in the database. For Example: Put a desired item in the sales order. For warehouse processes such as put-away, picking, movement and inventory, you can use special devices that offer an integrated laser scanner for maximum performance. Take advantage of the built-in camera for documentation of your work. Include photos to your service order or warehouse scenarios in the processing of returns and tie directly to the related record in Microsoft Dynamics. In addition, the app offers a design tool to highlight areas in the photo. 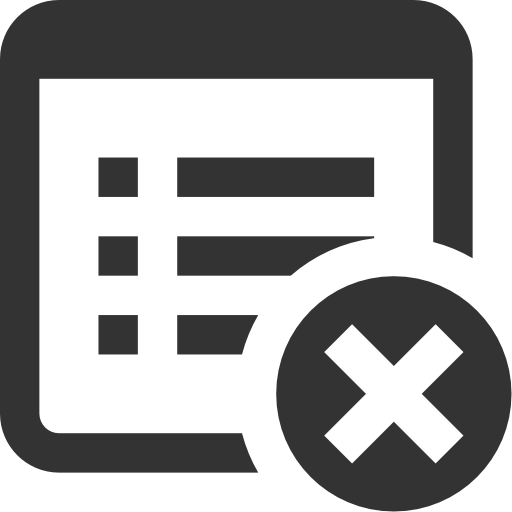 For Example: Simply mark damaged areas of an article or a machine. Instead of fully synchronizing to and from, the user can also choose to make a one-way sync (“Quick Send Function”) from the Anveo Mobile App to Microsoft Dynamics 365 Business Central and Dynamics NAV. Data will be processed immediately in the background. 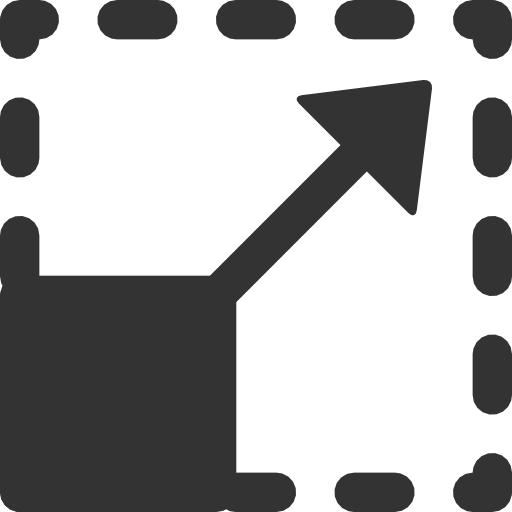 So, the user is able to continue working with the app right away since processing by the Anveo Delta Server does not take place. This gives your business the competitive advantage over other businesses, especially in time-critical processes. A push notification can optionally be sent to the user to confirm data processing was successful. You know this scenario. Whenever you need urgent information, your internet connection is slow or not available at all. Anveo Mobile offers the solution. While working with Anveo Mobile no internet is required. All data and business processes are located on the device. Synchronize data afterwards when internet is available – manually, automatically in background when idle or in key processes such as a sales order release. 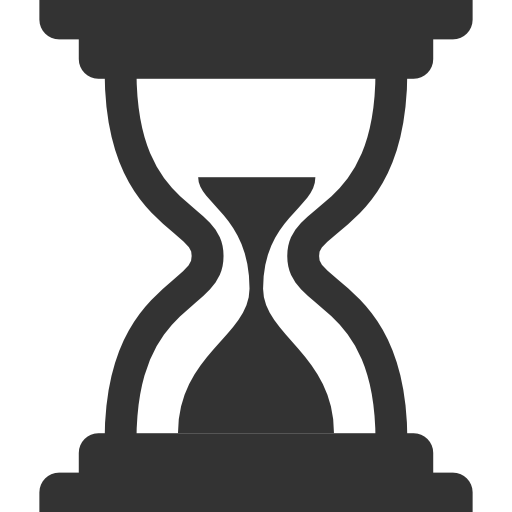 Your scenario: In order to reduce the load on your Microsoft Dynamics 365 Business Central and Microsoft Dynamics NAV system and to save bandwidth, a full sync is only allowed every 15 minutes or two hours. In the meantime, your mobile employees can send their data one-way to Microsoft Dynamics to make sure your back office gets the information and related tasks in a timely manner. 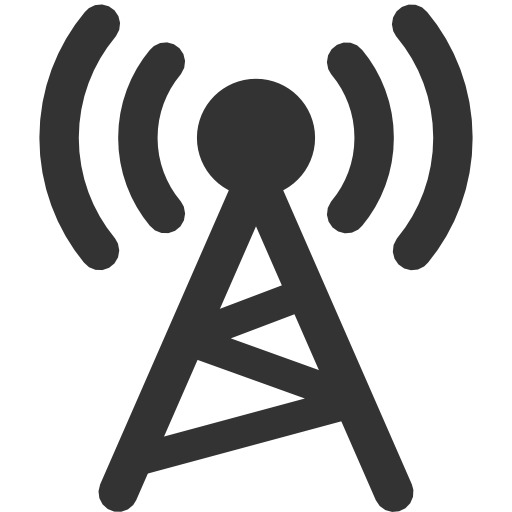 Your scenario: Your mobile sales representative is working in areas with low bandwidth (e. g. in rural areas). The Anveo Mobile App automatically uses the Quick Send Function to transfer data to the Dynamics system easily and in a timely manner without being obliged to make a full synchronization. Once there is a faster internet connection, e. g. LTE/4G or WiFi, comprehensive changes will be re-synchronized from the Microsoft Dynamics system to the app. Anveo Mobile App automatically detects the quality of your employee’s internet connection and decides how many information will be synchronized. Thus, the user saves time and data transfer will be very fast. Your scenario: Your mobile sales representative has created many order lines offline, or your mobile service technician has recorded comprehensive measurement values with the Anveo App. These data have to be sent to Microsoft Dynamics 365 BC or Microsoft Dynamics NAV. To ensure data transfer takes place as fast as possible, there won’t be a full synchronization. The App recognizes big data volumes and automatically uses the Quick Send Function. The user can immediately continue working with the App after having send the data to Microsoft Dynamics. Afterwards, a full sync can be carried out anytime. Your scenario: Your employee has created a new sales order whilst travelling from one customer to another. Your business procedure says that an order needs to be completed before it can be synchronized to Microsoft Dynamics. With Anveo, you can stop synchronization in case there are still some open order lines for example. You can customize this function according to your needs. Your scenario: Your mobile sales representative is on the road to his/her next appointment after having visited a customer. Define an automatic sync being carried out anytime your employee moves with a certain speed, e. g. of minium 20 km/h. Thus, the driving time can be used optimally for synchronization. All orders have already been sent and processed and, what is more, the user can access the most recent data when arriving at the next customer. If there is no sufficient internet connection for the synchronization, you can define a new sync attempt after a certain period of time. Example Action Codes: ASLS_FNC:GPS_ON to turn on GPS tracking in main menu and ASLS_FNC:GPSTRACKSEN to run the tracking. a) Determine certain documents (e. g. more history information, pictures and manual) to be transferred on the mobile device every time an order is created. You can also define those documents to be deleted automatically if they haven’t been used for e. g. 2 weeks. Thus, the user always has all necessary information; the mobile device and the data volume won’t be overloaded. b) Your mobile user can retrieve the history on-site at the customer by just touching a button. You can also delete the data from your mobile device automatically in the background after a certain period of time. Example on Customer Card (ASLS_CUSTOMER), “Load Extended History” using Action Code ASLS_FNC:TDM and Synchronization Package SALES_DYNAMIC. a) Send the order to Microsoft Dynamics NAV by using the Quick Send Function. Your employee will get a push notification to be informed if the order could be created correctly. b) Set a minimum quantity in NAV. If the number of articles on stock falls below this quantity, your employee will be obliged to fully synchronize before confirming the order (e. g. by getting the customer’s signature). c) Define other processes, e. g. approaching to the credit limit or verification of graduated prices through NAV. There a many possibilities to call for a validation/synchronization with your NAV. Kindly contact our partner managers to find the best solution for your scenario. Kindly watch our webinar recording from 14 March, 2017. In this video we present the new features of Anveo Version 8, e. g. extended Synchronization Management, Active Directory Integration and Multi Tenancy Support. The mobile Anveo database on the device is encrypted, so even if a device is lost, no direct access is possible. The exchange of data is SSL is secured through an encrypted channel. Security is our top priority. We protect the heart of Microsoft Dynamics NAV, the NAV Server, by our own Anveo Server. 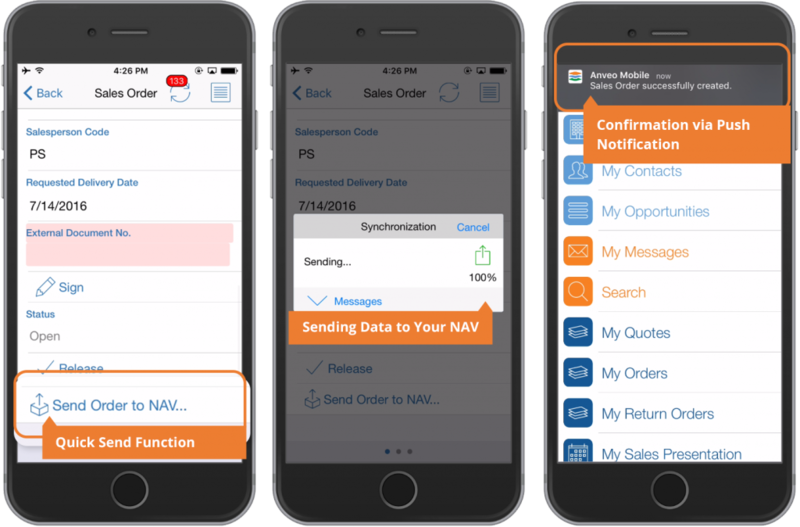 Our Anveo Mobile solution is currently the only mobile app solution available for Microsoft Dynamics NAV (and Navision) that hides Web Services completely (January 2018). It is not available to the public as in most other app solutions. User name and password will be taken directly from the Windows login. Passwords can only be changed in the Active Directory to ensure application of password guidelines. The changes will be transferred to the Anveo Mobile App with the next synchronization. Since Anveo Client Suite 8 Release, it is possible to serve multiple tenants while running Anveo on a single server. 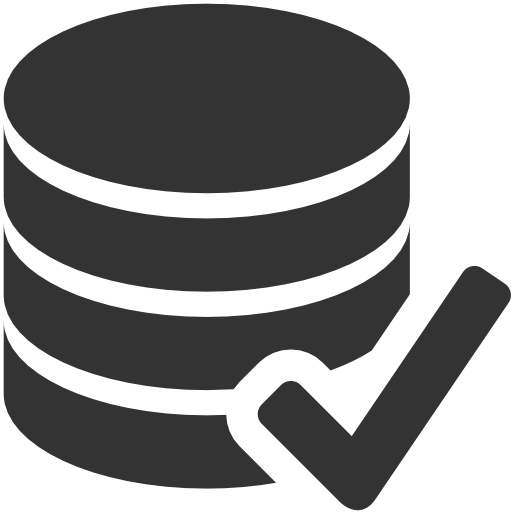 This saves resources on the SQL server and is often used for hosted multi-client systems. 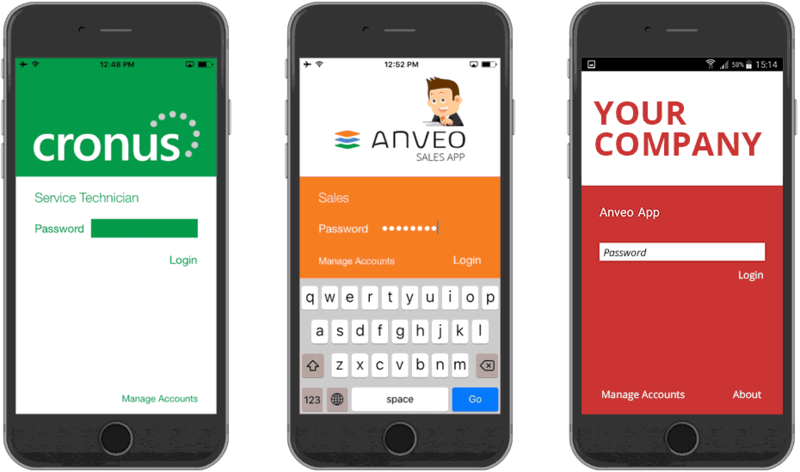 Customize your Anveo Mobile App with only a few mouse clicks: Directly in Microsoft Dynamics 365 Business Central and Microsoft Dynamics NAV Windows Client. 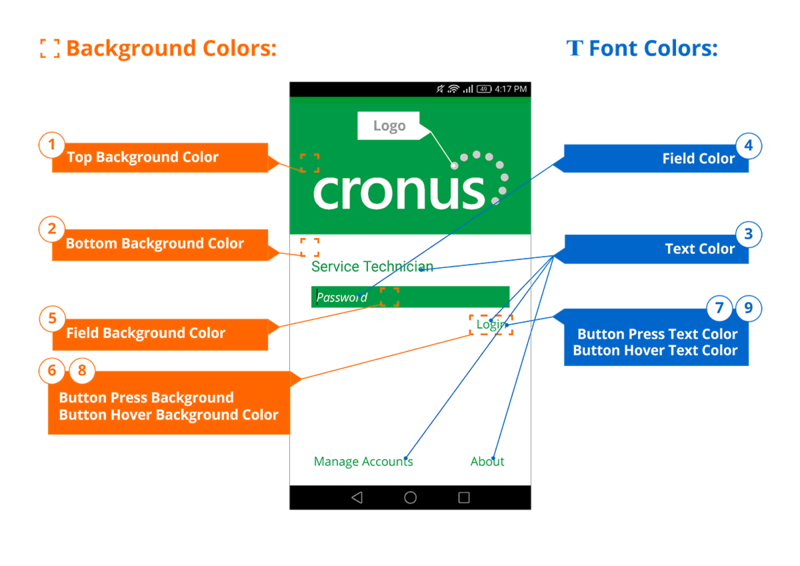 Just define your logo and colors, and the app will appear in your corporate design. Branding can be defined in the Anveo Mobile App User’s main menu. In the Windows Client, color properties and logo field are available. 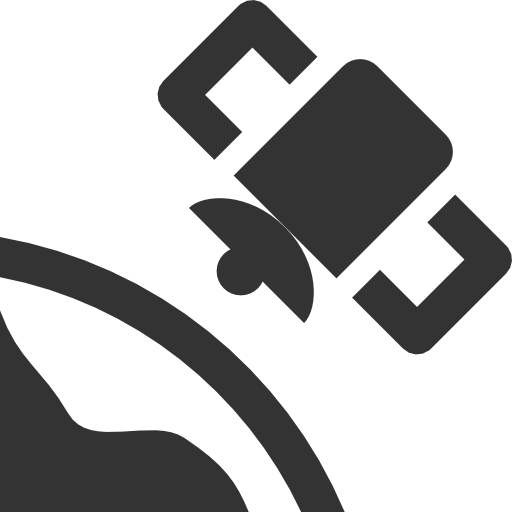 The logo will be scaled automatically and can be uploaded in png format with about 500×500 px. The set-up is almost identical for all mobile operating systems – due to technical differences between Android, iOS and Windows, not all color values are available in every system. The Branding function is availabe from Anveo Client Suite Version 7 and can be added susequently to existing Anveo Client Suite Versions. In order to update your Anveo Version please contact your Anveo Partner or take a look at the Anveo 7 Update Documentation. Due to technical restrictions, Basic Branding won’t allow adjustments of app symbols and name. If you are interested in Extended Branding, our Partner Care Team will be happy to assist you.